I have developed the most bizarre relationship with Le Labo Santal 33 fragrance. I received it last year in my Liberty Beauty Advent Calendar (I know! This years only landed last week - with a different Le Labo fragrance by the way!) and it has hung around for the past year creating the most unusual senses within me every time I smell it (or even look at it!). Firstly, it transports me back to the pure excitement of receiving my first ever Liberty Beauty Advent Calendar - one of the best presents I ever received - each drawer just got better and better! The scent itself thankfully doesn't remind me of Christmas (that would be weird mid summer!) but when I see this brand it will always remind me of the Beauty Advent Calendar from Liberty London because this is the first time I ever came across Le Labo with it's minimal typographic packaging and it's uniqueness within the perfume market. Ok, so the scent. The first time I smelt this fragrance, I turned my nose up. Not particularly because I didn't like it but at the same time I didn't know if I did. It wasn't like anything else I had ever smelt before. It is a strong defined aroma which upon first (and subsequent) smells took me back to late 70's/early 80's when I was a small child walking into the old traditional shoe shops with my mother and that smell of leather shoes hitting you as soon as you walked in. Now, this is a happy nostalgic memory but I can't say that the smell of old shoe shops fills me full of joy, hence the conflicting opinion that started my journey with this fragrance. "One of the Liberty London fragrance hall greats, Le Labo's Santal 33 eau de parfum is an iconic scent that maintains its exceptional power to stand out in a crowd. A timeless and transcendent depiction of the American West, it fuses rich smoky wood alloy, spices and leather with sweeter notes of iris and violet to create an addictive unisex scent that is both comforting and unforgettable." I found myself picking this bottle up quite often to smell it. I wore it a few times but not many. The bottle, which I love, has (I kid you not!) sat on my home office desk for the past year. It never made it up to my dressing room to join all the other perfumes I own but it still hasn't left my sight. My husband has come into my office on many an occasion and sprayed it on himself (it's a unisex fragrance) but I won't let him take it away with him. And I also love the trail of aroma that he leaves in my office after he has sprayed it but yet I still never feel the urge to spray it on myself, perhaps because I have my 2 signature scents that I mostly go between with a couple of others now and again and because I'm not sure this scent is 'me'. I love Chanel No.5 but I don't feel like it is me. For years I have smelt this perfume and loved it but always felt it was for an older woman (and my mother wore it, and still does). I am actually now the age she was when she started wearing it - the moral of the story here is that I don't think I will ever 'grow' into it! Fragrances have all sorts of memories and connotations and I have many a story and fondness of quite a few over the years. 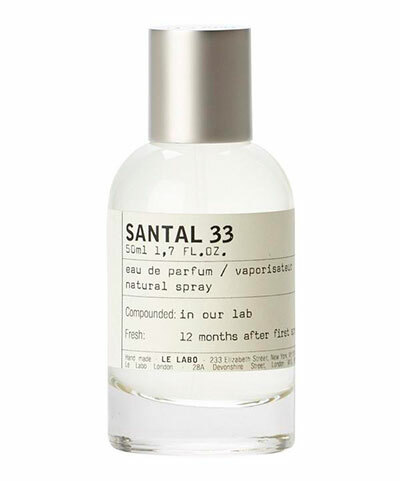 But Le Labo Santal 33 has been the most bizarre one for me. It has no reference point as such for me, I don't dislike it but I don't love it. I just wonder how I will feel once it has lost it scent completely. I have the tiniest amount left in the bottle and I wouldn't let my husband touch it until I had at least wrote this article. But now that I have shared my thoughts with you, there is no reason not to let him finish it if he so wishes. However, a part of me doesn't want to let the last bit go (which is silly, not least because there is so little in it, it will eventually evaporate!). I'm sure the scent will linger in the bottle even when the last traces of liquid has gone but I wonder how I will feel when I can't smell it any more. Will I have the urge to go out and purchase a bottle? And if I don't I am also intrigued to know in a few years time when I pick up a bottle while passing through Liberty London Beauty Hall, how it will make me feel. Have I already created a future nostalgia for this fragrance?! I guess you could say that Le Labo Santal 33 is my guilty pleasure!